This post is focused on how to Add Author Box in WordPress theme. You might have seen Very Creative, Elegantly designed, Good Looking or Very Simple Author Box on many websites. But the point is, does look and feel of an Author Box matter? Here I will share how to Add Author box in WordPress with or without using a plugin. 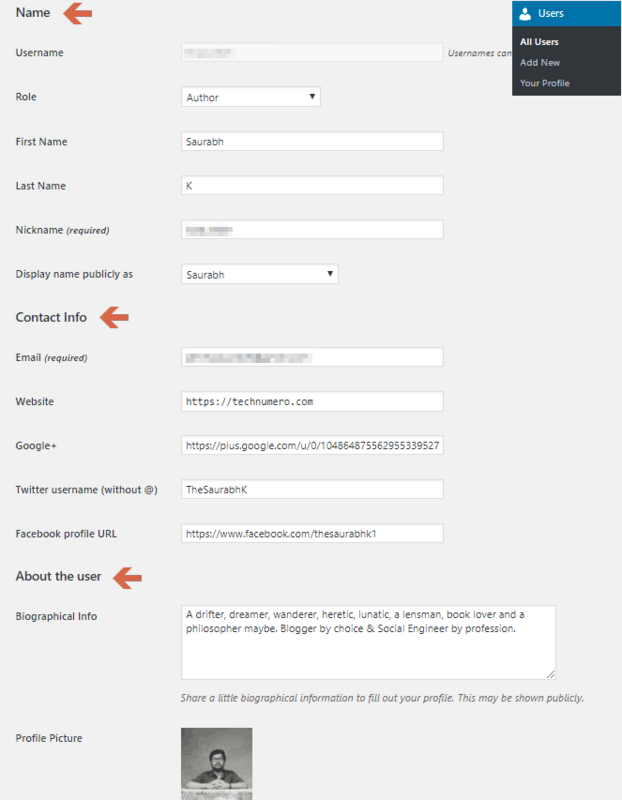 And How you can customize Author Box on WordPress site. First of all, let’s discuss What is an Author Box? Why should you use Author Box? And How using an Author Box in WordPress could be helpful to build Author Authority. What is an Author Box? A specific block on the post page (single post or page) of your website, with the information about the post author, displayed after or before the post content called Author Box. Generally, an Author box is used to share the information about the article author with the readers. You can add Author Image, internal and/or external links related to Author bio, his/her profile and social media links etc. Why should you use Author Box? Nowadays, it quite common to Add Author Box on single post page. The author box becomes essential when you own or manage a multi-author website. It also helps visitors to distinguish between the authors’ posts easily when several authors are writing for your site. The information (apart from name and photo, obviously) provided in the Author Box as Author Description or Author Bio is important in order to build trust and create a personal connection with the visitors. That is the very basic step to build Author Authority. And I need not say that visitors are more likely to return on the websites run by real personalities instead of running by bots or admins behind the curtain. How to build Author Authority with Impressive Author Box in WordPress? As I have discussed why having an Author Box on your website is important. It helps you create a favorable environment for the readers to personally connect with Author by sharing key information about the Author through Author Box. You may have noticed that I have used a term ‘Impressive’ Author Box. What does that mean? I think, there is no point of adding an Author Box on Single Post if you are unable to draw the attention of your visitors on Author Box. Right? I usually look for Author Bio (brief profile) on the websites I visit (after or during reading the article). And I have seen many websites with different Author Box designs, bio info, links etc. Here, I am sharing a couple of probable reasons, why visitors are not drawing attention on your Author Box. Social Links – not available or too many social profiles. This really not an exhaustive list and does not cover every reason. However, there could be few more reasons, which are not directly related to the Author Box but should be considered like the quality of the content, web page speed, too many ads etc. Okay! Now let’s discuss, how we can fix that. Here is the list of things which we need to keep in mind while adding an Author Box on Single Post in WordPress site. Add Author Box on Single Posts – Add a simple but attractive Author Box. This is the first and primary step to start building Author Authority and reputation. Add Author Name – Use your real name i.e. First Name and Last Name. Add Author Avatar – You could use your Gravatar Account for the same. Add Author Bio – Add information about yourself, what you do, what you love, where else you write. Try to share information about yourself, so that readers could relate. Keep it simple and brief i.e. not more than 30-40 words. Add Author Social Profile Links – This is quite popular and helpful to get more followers, but avoid too many social media links. Add Author Email – If comments are not enabled on the post, you should add author email address. Genuine Readers do want to share their feedback or query about Interesting posts, how-to guides etc. Add no. of posts written by the Author – This is tricky, you may mention no. of posts written by the author and link the same to Author Archive. The number of posts written by the Author shows your experience and engagement with the site. Which creates a positive impression on readers. However, it could be optional, but I recommend this. Add a Feedback Button – You can also add a unique feedback option for readers. It could be a like or dislike button, a tweet button with the custom tweet. Avatar (Gravatar Image) – Read a detailed guide to set up Gravatar Account properly. The number of articles written (on the same website) – Like you can in this website itself. When you want to Add Author Box in WordPress without plugin, I am guessing that you are ready to edit your WordPress theme files. Yes! you need to add a couple of lines of code in your WordPress Theme file to make it work. But, before adding any code in your theme, I would recommend you to create and use a child theme in WordPress (if you are not using a child theme) It will prevent you to break-down your site completely if anything goes wrong. However, you do not need to worry about adding the code to your theme file. I have tested this code on many WordPress themes and it works perfectly fine with all the WordPress themes. This code had been tested with several WordPress Themes like MyThemeShop, Elegant Themes, Themify etc. I was recently working on a project called TerraTale, where I followed given below steps to manually add author box in WordPress theme (as shown in the figure). The theme I used to develop this website is Dividend from the house of MyThemeShop. And the final Author Box looks like this. Firstly, I created a child theme; Use this tutorial to create a child theme. Now, create a single.php file in your child theme folder. I would recommend using a plugin to copy the single.php file from Parent Theme Folder to Child Theme Folder. Further, you need to add the following CSS code in your style.css file of your child theme. That’s it. A customized Author Box has been added to your WordPress theme. Now, you need to configure your Author Profile. Go to the Dashboard > Users > Your Profile. Now, Add your details in Name, Contact info and About the user section. Click on the Update User button and You are done. Check your customized Author Box in your posts. You might find difficult to view your Author Box as per the design, that could be because your new/additional CSS is not loading properly in your browser. Read this guide for the same. CSS Changes not Showing Up in WordPress – Cache Busting CSS. Note – If your theme adds an author box by default, you need to disable theme supported author box. If you don’t do that, TWO author box will get displayed on your website. There are many Author Box WordPress Plugin you can find in the WordPress Plugin repository for free. Here I am sharing top 3 plugins which will let you Add Author Box on single post. And you don’t need to worry about the quality of these plugins, as I have tested plugins personally and also using the same on a couple of my other websites. So, let’s learn about how to add Author Box in WordPress with Plugin. The first plugin on the list is Simple Author Box WordPress Plugin from the house of Macho Themes. Following plugin features will definitely convince you to give it a shot. This plugin works with all the recent versions of WordPress flawlessly. The Simple Author Box plugin lets you Add Author Box on Single Post without making any impact on PageSpeed. It creates responsive author box which looks great on all the devices. Also, it is fully optimized for small screen devices. Simple Author Box plugin allows you to add Author Gravatar Image, Author Name, and their description. You can also add your social profile links to 30 different Social Media Platforms. This plugin will automatically add author box at the end of your article i.e. after the content hook. However, you can also add author box manually in your webpage using the shortcode provided by the plugin. Follow these Steps to Setup Simple Author Box Plugin and Add Author Box on Single Post. The next Author Box Plugin is developed by the team of AccessPress Themes called Ultimate Author Box Lite WordPress Plugin. The plugin is fairly new, but it has quite a number of unique features, which allows this plugin to stand out from the crowd. The free version of Ultimate Author Box plugin comes with 5 different Author Box templates, and each one looks elegant. You may add up to 10 Social Profile links of the author. The plugin allows you to add Author Images from your Social Profiles i.e. Twitter, Facebook, Instagram etc. And you can also add a custom image if you want to. You can customize your Author Box with any color you want. You can also add Multiple Tabs to your Author Box i.e Latest Post, Twitter Feed, and Author Details Tab apart from Author Description etc. The plugin has multiple options to show or hide Author box on individual posts, pages or on custom post type. Ultimate Author Box plugin is designed for all kind of devices. You can also add author box anywhere on your website by using a shortcode. Follow these Steps to Setup Ultimate Author Box Lite and Add Author Box on Single Post. The third WordPress Plugin on the list is quite unique in its own way. The Meks Smart Author Widget plugin is developed by Meks Themes. This Author box plugin is also available for free like rest of two in the WordPress Plugin repository. Actually, this plugin lets you Add Author Box in the WordPress widget area i.e. Sidebar widget area, After the Post widget area. The following points will walk you through with its features and how it works. The plugin has a very simple user interface. Meks Smart Author Widget has an option to customize the size of Avatar Image. It adds Author Box in the WordPress widget area. The plugin automatically detects the Author of the post and displays Author Box widget. You may also replace the Widget Title with Author Name. It allows you to add Author’s Post Page link with Gravatar Image or with Author Name. Follow these Steps to Setup Meks Smart Author Widget and Add Author Box on Single Post. Hope you find this article helpful. Which method do you use to Add Author Box on Single Post or you might have chosen to go with an Author Box Plugin? Do you think Adding an Author Box is important for you? Do share your thought in the same via the comment section below. Very helpful post. You done a great work keep it. Thanks for this info! I just used the code to add an author box on my website. Useful post although I ended up using Molongui Authorship plugin, not listed here but the best author box plugin I’ve found so far.